dolls of all ages and in many countries. She writes: ‘Any woman left alone to amuse a baby may find herself fashioning a primitive toy out of a handkerchief, a rag or a piece of paper’. Thus we find doll-like objects among the relics of the earliest ages, and while dolls have assumed the most elaborate forms at different periods of history, the motive has remained unchanged –the affection of children for miniature replicas of themselves. Even the poorest children fashion playthings out of the materials at their command. This book is international in its scope. 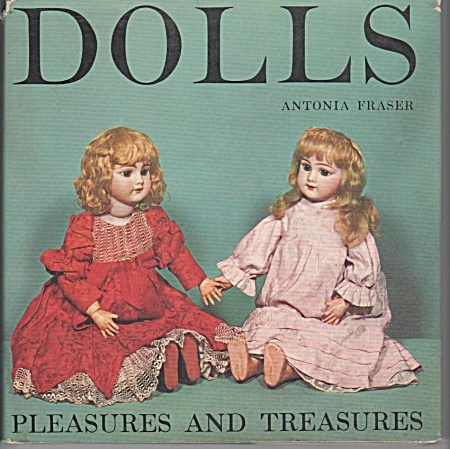 Dutch dolls, Japanese dolls, American Pennywoods, Peg dolls, the European fashion dolls of the seventeenth century, German and Italian doll-makers and Queen Victoria’s own collection of dolls, all find their places in these pages. Particular attention is paid to the materials from which dolls have been made, the clothes in which they have been dressed, and the mechanical devices by which head and limbs have been attached to the body, culminating in the inspired automata of the last three centuries. The illustrations, many of them in color, provide a delightful panorama of the subject. The majority have been specially photographed for this book in museums and private collections in Europe and the United States. is in good condition. The text is clean and the binding is tight. The bottom edge of the book has shelf wear. The dust jacket has a couple of tears, approx. 2 ½ inches long. Published by G. P. Putnam’s Sons, copyright 1963.